The system requires two excavation holes, no larger than 1m x 1m, to extract an old pipe while towing in the new replacement. Up to 25m of galvanised iron, copper, lead or poly pipe can be easily replaced in a single pull (for diameters up to 1¼ in). 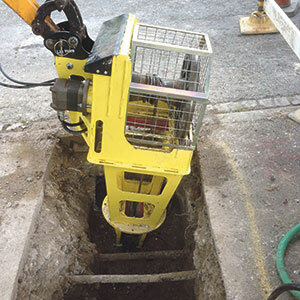 The 400 Series is designed to operate from the auxiliary hydraulics of a mini excavator. It is said to provide greater pulling power and efficiency improvements for contractors. 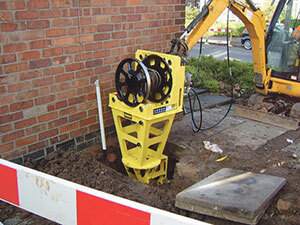 The unique spool design makes removal of the pipe from the spool after extraction quicker and easier, while the rotatable foot means the puller can be positioned in any direction to suit excavator access. This entry was posted in News and tagged Pipeline Replacement. Bookmark the permalink.